Misconduct has traditionally been tied to the pressures of "publish or perish" and, more recently, to the new opportunities offered by electronic publishing. The conference takes the next step to ask whether the modalities of misconduct are now evolving to adapt themselves to modern metrics-based regimes of academic evaluation. Have we moved from "publish or perish" to "impact or perish"? If so, are metrics of evaluation now creating new incentives for misconduct? And can we still reliably draw a clear separation between gaming the metrics game and engaging in misconduct? 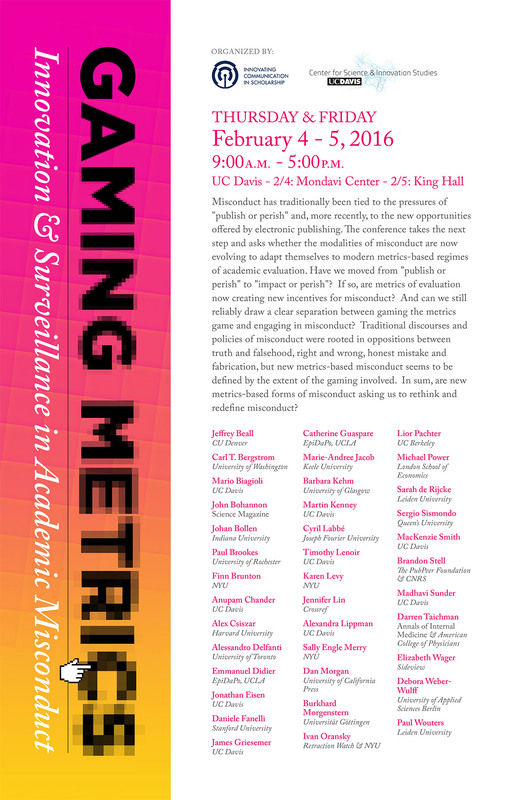 Traditional discourses and policies of misconduct were rooted in oppositions between truth and falsehood, right and wrong, honest mistake and fabrication, but new metrics-based misconduct seems to be defined by the extent of the gaming involved. In sum, are new metrics-based forms of misconduct asking us to rethink and redefine misconduct? The conference is open to the public. Please register here<http://goo.gl/forms/QdMyTg1xZt>. Although attendance will be on first-come first-serve basis, we will reserve seats for out-of-town participants. The conference will be held at two different locations on the UC Davis campus. On Thursday, February 4 we will convene at the Vanderhoef Studio Theatre, Mondavi Center. On Friday, February 5 our proceedings will take place in the Kalmanovitz Appellate Courtroom at King Hall (UC Davis Law School) (http://campusmap.ucdavis.edu/?b=95).